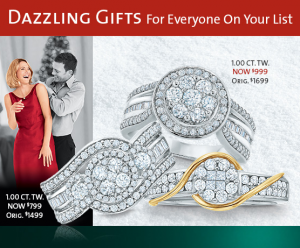 Shop Pre-Boxing Week Sales and Deals at Mappins and Peoples Jewellers! Save up to 25% off all regular prices on an amazing Mappins and Peoples Storewide Pre-Boxing Day sale. Looking to propose to that special lady in the new year? Now is your chance to get that gorgeous shiny diamond ring for a fraction of the cost. This sale represents Brilliant Value items only. Brilliant Value items already reflect the additional discount. This offer cannot be combined with any other offer. Ask a Jewellery Consultant in your local Mappins or Peoples Jewellers for details. This People and Mappins Pre-Boxing Week Sale runs from December 16th through to December 24th 2013. She will definitely say YES to a Mappins or Peoples ring! Why don't you say YES to shopping at Peoples or Mappins for Pre-Boxing Week Sales? Check out Mappins and Peoples Jewellers fabulous inventory here!